My daughter got this adorable 18 inch doll for Christmas from my mom, including all kinds of matching clothes and pajamas for the two of them. They have become BFFs and do everything together. We're pretty lucky that grandma likes sewing new clothes for the doll, because purchasing clothing and accessories for these dolls can cost a lot of money that this mama doesn't have!! As I was going through my daughter's clothes, I found a few pairs of leggings that she has started to grow out of and some with holes in the knees. My mom recently made some pants for the doll using a purchased pattern and they have become a staple in the doll's wardrobe. Instead of making my mom sew even more, I decided to use the pants she made as a guide to create some fun leggings for the doll using leggings we already have. Upcycling clothing you already have helps save you money, and gets more use out of the fabric. The best part is, these leggings come together in about 20 minutes from cut to completion and are easy enough for even the most beginner sewer!! To start, gather some knit pants that your child has grown out of or have a hole in the knee. Knit works best because they have good stretch and it's easy to sew. You could also go to a thrift store and purchase some of these pants for really cheap! T-shirts will also work if you don't have leggings. 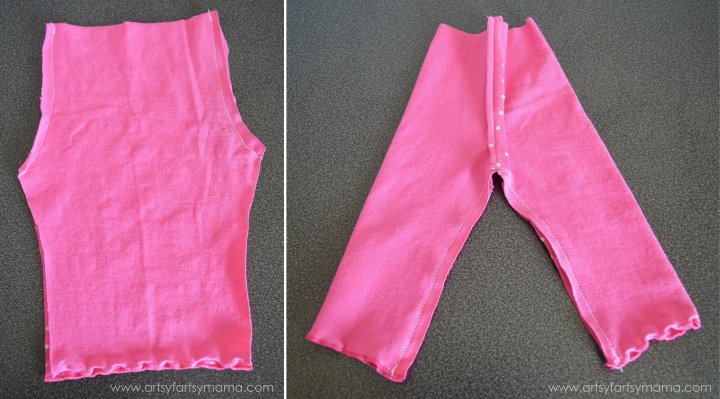 Wash the leggings before using them for this project and make sure there are no holes or stains below the knee area. Cut out the printable pattern (at the bottom of the post). Lay your leggings front side up and make sure your seams are lying flat and straightened out. All our leggings had only one seam on the inside, so there was a "folded" edge on the outside of the pants. If your pants have an inner and outer seam, you can still use them!! Just make sure the outer seam is lined up and straight. Line the pattern up with the bottom of the pants. This way, you won't have to hem your doll's leggings at all, saving you time! 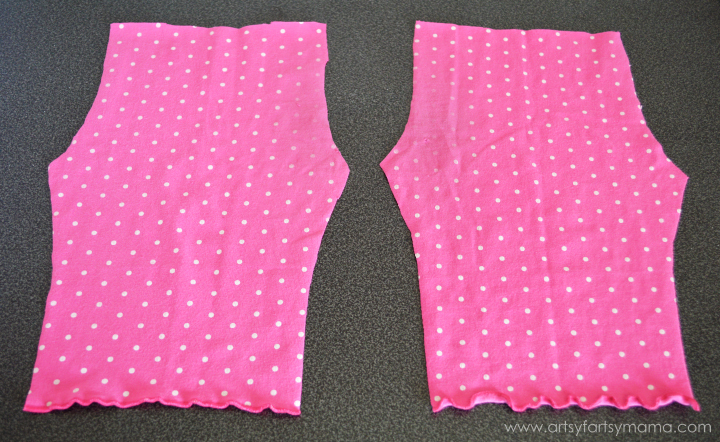 Align the right side of the pattern where it says "FOLD" along the folded/outer edge of the leggings. Pin the pattern in place or hold it down and cut all the way around. Then, turn the pants over so the back side is up and cut the pattern on the other leg along the fold. You should now have two pieces. If the leggings still fit your child around the waist, you can cut the legs completely off - try to keep the cut as straight as possible. Now your child has some shorts to wear this spring and summer!! You can hem the bottoms if you want, but I kept ours as-is since knit doesn't fray. Lay out the two pieces right side up. They should be the same size and look identical. Turn one of the pieces over and lay it on top of the other piece, right sides together. Make sure the hems are aligned, then pin the pieces together so you can sew them without shifting. To get the pants sewn together, you only have to sew three simple lines. You can use a matching thread if you want to get a more professional look, but I figured the doll isn't going to care so I just used white. I sewed everything with a 1/4" seam allowance. With the pieces pinned together, you can start sewing the leggings. Sew a basic straight stitch along both of the curved lines on the right and left sides of the pants (see the picture on the left). The top and bottom section should still be open. Now, fold the pants in half the other direction so the seams you just sewed are in the center. Flatten them out and they will look a little more like pants. 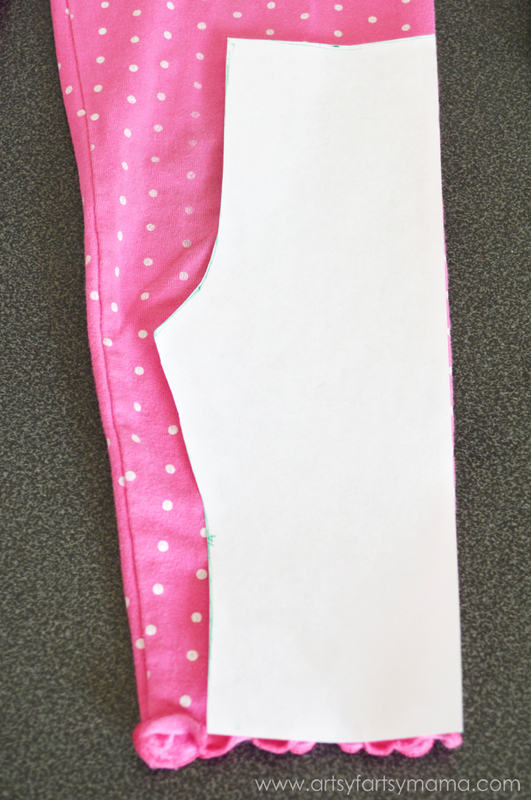 Pin the open edges together and sew the pant legs closed. I backstitched a few times over the crotch area to give them a little more stability. Now your pants should look similar to the picture on the right. Now your pants need a waistband! Fold the top edge down about 1/4", then over again about another 1/2 - 1". Pin the folded edge in place all the way around. 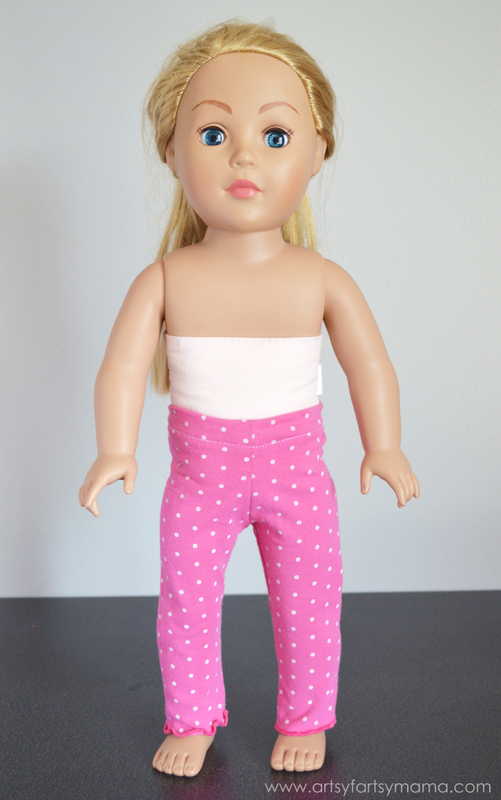 You can try the pants on your doll to see if the waist needs to be folded down more or less if you want to check. Also, depending on the amount of booty your doll has, you might want to adjust your waist fold. Our doll doesn't have much of one, so the pants fit fine with an even fold all the way around. If your doll has a little more junk in the trunk, you'll need to fold a little less of a waist band in back and more in front so that you have a little more fabric in the back to help keep the pants up where they need to be. Once the waistband is pinned in place, decide which side is the back of your pants and mark with a pin. Start just after the seam and sew about 1/8" from the folded edge all the way around until you come back to the seam. 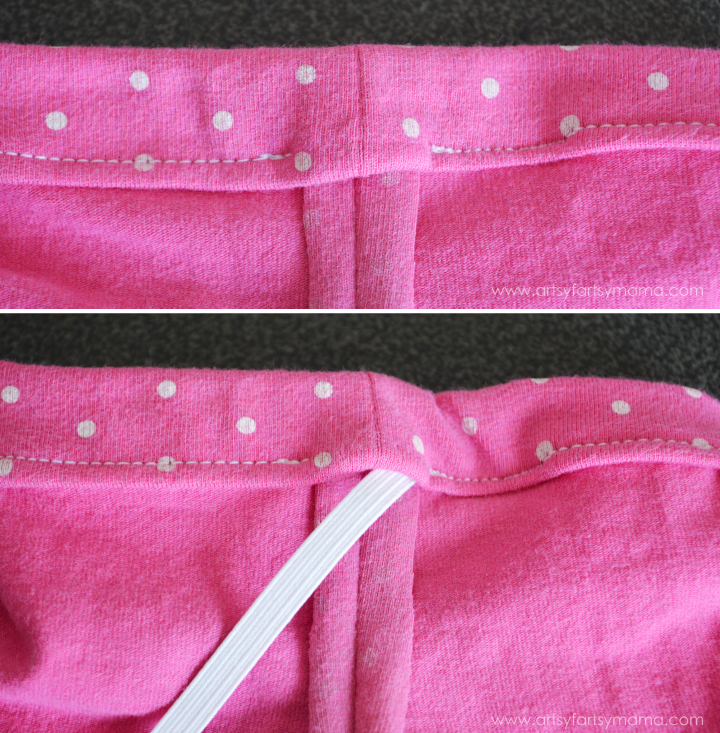 Stop just before the seam so you have a small opening in the waistband (see top picture). Cut a piece of 1/4" wide elastic to about 10.5-10.75". Measure your doll's waist if you aren't sure how big she is, but the average is about 10.5". You'll need the little extra amount of elastic to overlap and sew together. 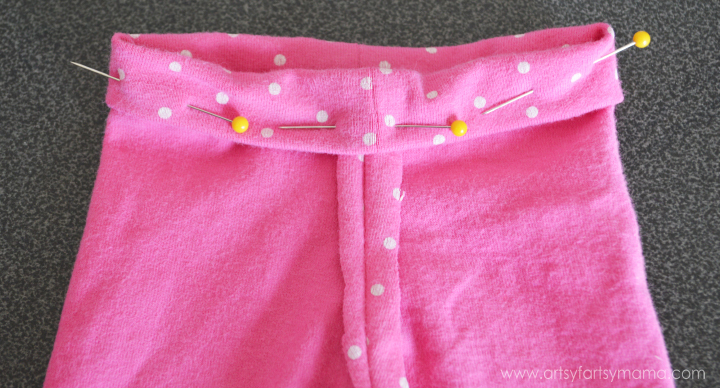 Stick a safety pin into one end of the elastic, then put it into open seam of the waistband (see the bottom picture). You'll be able to feel the safety pin inside the fabric, so you can easily push it all the way around the waistband and back out the other end. Once you get the elastic through, remove the safety pin and hold the edges together. Overlap the elastic ends and hand sew them together with a needle and thread. Your stitches don't have to look fancy - they just need to be able to hold the ends together well. Once the elastic is sewn together, pull the waistband until the elastic is no longer showing and is inside the waistband. Sew the waistband closed. Now your pants are complete!! Put them on your doll, and enjoy!! The leggings fit comfortably around the legs, but if you want to make the leggings tighter, you can take the pants back off and sew the seams a little farther in. 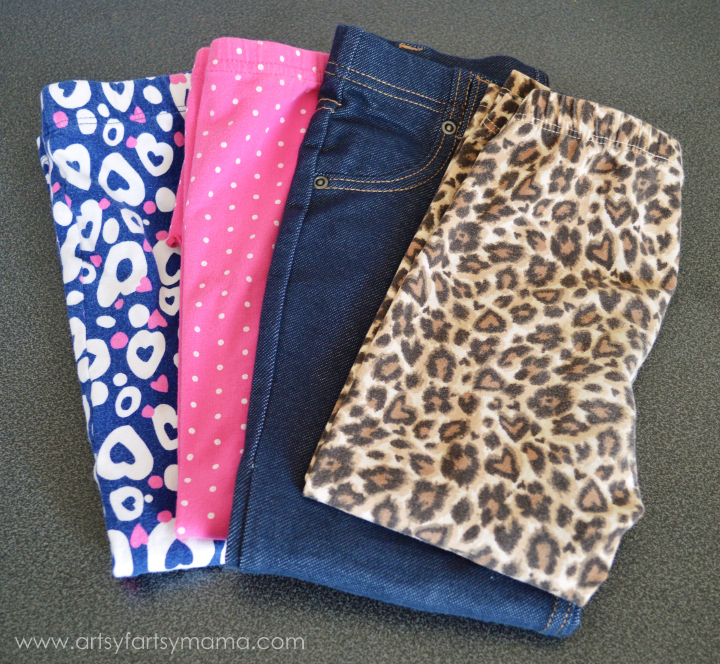 It's fun to make leggings in all different colors and fabrics!! Some of the leggings that had larger holes in the knees, so I made capris instead of long leggings. To make capris or even shorts, just push the pattern farther down (instead of aligning the bottom of the pattern with the hem) until you get the length you want. If you happen to have some jeggings (stretchy leggings with a faux-jean look), they look adorable on the doll! Cut the pattern the same way, but keep the stitched side seam (if there is one) instead of on the original fold. 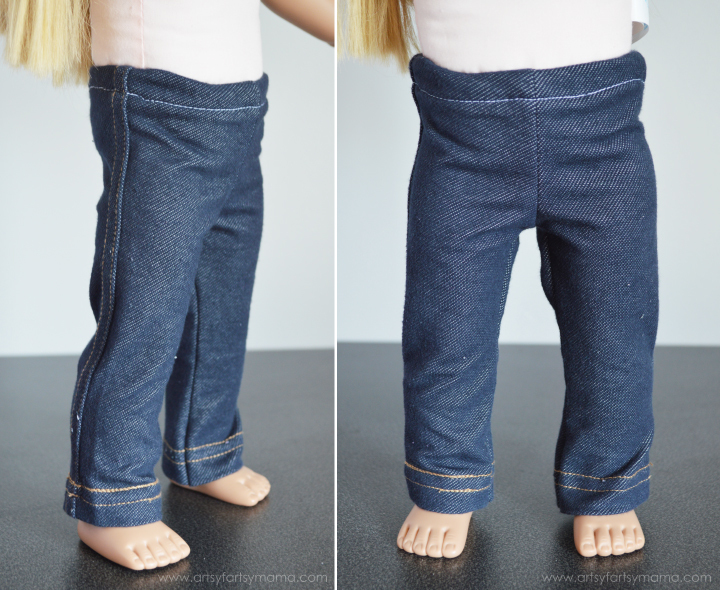 That way, your doll's newly upcycled pants look more like jeans, but fit snug like all jeggings should. You could probably use real jeans as well, but I haven't tried it...yet. This looks like a really fun and easy method to make some cool doll clothes. Thank you! I bet you have the best dressed dolls in toyland! :-) Looks great my friend. I love these! Pinned & Stumbled! Thank you so much for this easy tutorial! I had some adorable infant sized leggings I picked up at Goodwill the other day for $.99 and this was perfect. I plan to hit some garage sales to see what I can find for cheap to make some more as we recently donated all my daughter's outgrown stuff. Drat! Thank you for the pattern!! Now I can make pajamas to match my granddaughters. Their dolls will match them for Christmas. What size works best for this? What size leggings does this require or works best. Looks really cute, can't wait to try it. Just got into this, even thought my daughter had a My Twinn almost 20 years ago. Pulled both of them out today. Boy and girl. My friend's granddaughter has the AG, and it started out with furniture out of cardboard. 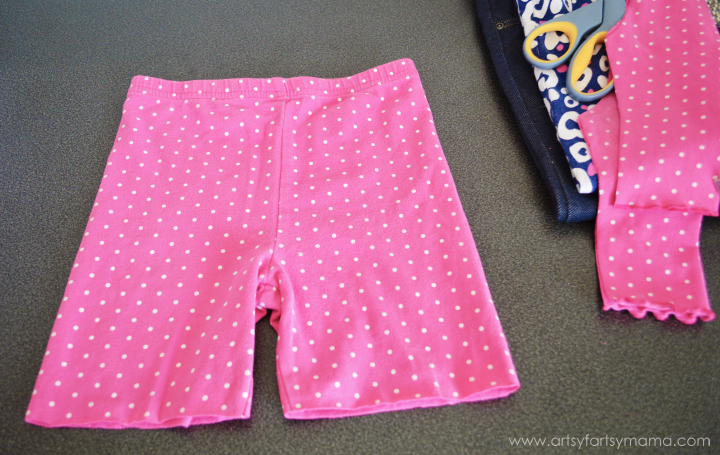 I just made 2 AG and 1 my twinn pajama pants out of left over material from my daughters pj pants, from years ago. This tip will be great because there are two little girls with the AGs. Thanks! Thank you for sharing and helping us parent's save money and teach our daughter's continuing skills. Are the seam allowances included on the pattern or do I have to add extra? Such a cute pattern - thank you for sharing it! Tried to print but my computer won't let me change it to print full size. It keeps adding margins. Could you give the measurements of the top, bottom, and straight side so I can enlarge it? Are we allowed to sell leggings made with the free pattern? I thought left a comment but I don't see it. I was wondering, is it ok to sell leggings made from your pattern? Oh, I didn't notice the message about approval last time, sorry! OMG thank you! I make #resistancedolls and they have had bunchy pants so this is saving my dolls from that!